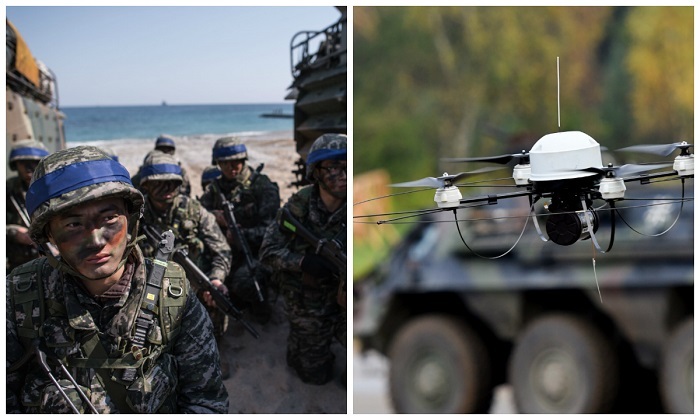 South Korea will have a military unit operating weaponized drones capable of conducting missions into North Korea and launching attacks by next year. The country’s army is creating a combat unit of weaponized drones – called “dronebots” – to help counter North Korea’s threats, an unnamed military official said Tuesday, Dec. 5, reported the Yonhap News Agency. The team plans to use the drones on reconnaissance missions against North Korean targets such as nuclear and missile sites, reported Yonhap. In case of a contingency, swarms of dronebots could be used to launch attacks on enemy forces. As part of their consideration, the official said that they are looking at how the Israeli military created a similar unit in 2010. While drones have been used in war conflict situations around the world for some time, emerging artificial intelligence technology will allow individual units to link up with others to create swarms, reported the Financial Times. Proponents of swarm technology say swarms of cheaply made drones could thwart area access by bunching around and blocking ships or aircraft. Bong Young-shik, an expert on North Korean military developments at Yonsei University, backs the idea. “Some of us in the field proposed the Republic of Korea military should take advantage of this superiority against North Korea,” Bong told the Financial Times. “Although it is unlikely, if the South Korean military wants, these drones can carry bombs as the nation is no longer bound by payload limits,” he added, referring to a recent U.S. decision to lift restrictions on South Korean munitions. The talk about plans of drone warfare use against the North Korean threat comes during heightened tensions on the peninsular over Pyongyang’s nuclear and missile programs.